:: Ilusi Dalang :: All The World's A Stage..
With the 20th anniversary of the tragic Hillsborough disaster fast approaching, artists John Power of the La’s and Cast fame, Peter Hooton of The Farm, Mick Head of Shack, Nick Kilroe from Echo and the the Bunnymen, James Walsh of Starsailor and Rob Taylor of the Troubadours have joined forces to record a song to commemorate the occasion. Several Liverpool legends also appear on the track as Kenny Dalglish, Bruce Grobbelaar, Phil Thompson and John Aldridge all participated in the making of the record. The song will be available to download from April 6, with all proceeds going directly to the Hillsborough Families Support Group. LONDON, Nov 21 — Michael Jackson has become a Muslim — and changed his name to Mikaeel. The skint superstar, 50, donned Islamic garb to pledge allegiance to the Quran in a ceremony at a pal’s mansion in Los Angeles. Jacko sat on the floor wearing a tiny hat after an imam was summoned to officiate — days before the singer is due to appear at London’s High Court where he is being sued by an Arab sheikh. A source told last night how Jacko, brought up as a Jehovah’s Witness, decided to convert as he used a studio at the home of his chum to record a new album. The star — whose hits include “The Way You Make Me Feel” — was spotted looking “a bit down” by a producer and a songwriter who had both embraced Islam. The source said: “They began talking to him about their beliefs, and how they thought they had become better people after they converted. Michael soon began warming to the idea. Mikaeel is the name of one of Allah’s angels. “Jacko rejected an alternative name, Mustafa — meaning ‘the chosen one’”. British singer Yousef Islam, 60 — who was called Cat Stevens until he famously converted — turned up to help Jacko celebrate. It was his pals David Wharnsby — a Canadian songwriter — and producer Phillip Bubal who counselled Jacko. The pair’s new names are Dawud Wharnsby Ali and Idris Phillips. Jacko now prays to Mecca after the ceremony at the Hollywood Hills home of Toto keyboard player Steve Porcaro, 51, who composed music on the singer’s Thriller album. Jacko, who rarely ventures out without a mask, is due to give evidence on Monday in a £4.7million (RM25 million) lawsuit brought by Prince Abdulla Al-Khalif of Bahrain. The sheikh claims he bankrolled the singer’s lavish lifestyle in exchange for an exclusive recording contract. The billionaire sent songs for him to record but claims he was blanked. 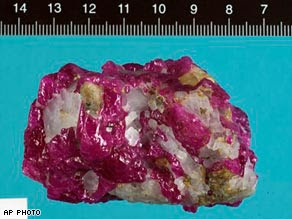 Police display photo of the uncut ruby, known as the "Prince of Burma." VIENNA, Austria (AP) -- A raid on a suspected gang of international jewel thieves has recovered an uncut ruby known as the "Prince of Burma" worth 3.2 million euros ($4.1 million), Austrian authorities said Thursday. Two men and a woman were arrested in the raid Tuesday afternoon in the southern town of Villach, Austria's federal criminal investigations bureau said. The three are suspected of stealing the ruby along with diamonds and and other gems recovered in the raid from a German jewelry dealer in Milan, Italy in August. The dealer, identified only as a man from the German city of Idar-Oberstein, was tricked into going to Milan by the female suspect and was seriously injured by a car during the theft, investigator Gerhard Joszt said. Police said the stolen jewels are worth an estimated 3.5 million euros ($4.5 million) in total.